PASSION: NOUN: 1. A powerful emotion, such as love, joy, hatred, or anger. 3a. Boundless enthusiasm. b. The object of such enthusiasm. SYNONYMS: fervor, fire, zeal, ardor. Yes folks, history is my greatest passion. That much should be obvious. I don't know where it came from, but I am glad it's there. It all started with World War Two. I can remember reading my uncle's Time/Life books on World War Two, when we went to visit. I was probably about ten or eleven when that started (please note, all ages and dates are subjective, since I really can't remember the details of the development of this perfect passion). And it just grew from there. By the time I got to high school, I had developed an interest in the Civil War. The first Civil War book I ever bought was a biography of Stonewall Jackson (don't ask me to remember which one. If you'd see my collection of Stonewall books you wouldn't ask *LOL*). Then it snowballed. My dad and I went on a Civil Wargasm in 1990, the summer after I graduated high school. That was mega fun. Petersburg, Chancellorsville, Appomattox...oh that was the greatest. Want to know what I find most interesting? Usually interests and passions pass from the older generation to the younger, right? Not in this case. My fiery love of history has rubbed off on my dad in a very serious way. He is now an architectural historian (his primary historical interest) and has researched the history of many of the houses in our neighborhood. His own house is a late Victorian Second Empire, built in 1899. He and my step-mother have restored most of the rooms in the house to Victorian look. It is quite lovely...but I digress. Back to ME *chuckle*! Yes...the Civil War. Well it is much more than just the Civil War now. I consider myself a military historian, as I will read almost anything about almost any war and enjoy it. My passion for World War II runs as deep as it always has, as does my Civil War interest. However I can feel my interest in World War I growing (to the extent that I asked my step-mother if she could find me a volume of Wilfred Owen's poetry (if you don't know, ASK!)). In fact I just bought John Keegan's one volume book on World War I this week. I'm reading it slowly around all my homework :) . I am about halfway through the conflict--I just started reading about the naval battle of Jutland this morning *grin*. 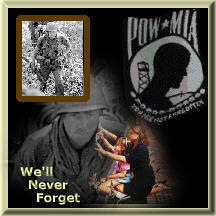 I am also very passionate about American MIAs, particularly those who were lost during Vietnam. I don't even really remember how I started to get involved, but I firmly believe in the cause. © 2001-2005 Keri Leaman. All Rights Reserved.